The Compañía del Tranvía de San Sebastián (CTSS) was founded on 28 August 1886 and is one of the oldest businesses in Gipuzkoa. Since its first tramline opened between La Concha, El Boulevard and the Ategorrieta Depot on 18 July 1887, the CTSS has guaranteed the mobility of the residents of San Sebastián for more than 115 years through four different modes of transport: horse trams, electrical trams, trolleybuses and buses. In 1887, the city of Donostia had a population of 26,856 and was amid an urban expansion programme after the city walls had been recently demolished in 1864. The tram became a fundamental element in this process by reducing the travel times on journeys over increasing distances. The first line between la Concha, El Boulevard and Ategorrieta was soon extended at both ends to Venta Berri and Rentería respectively on 13 July 1890. A few months earlier, on 21 April 1888 a short branch line was inaugurated, which linked the tram network with the Northern Railway station. The horse trams, known as motor de sangre (literally blood engines), soon showed their limitations and for this reason the heads of the Company studied ways to modernise the transport system. They rejected steam locomotives because of the fumes and noise that they would create in the city and instead opted for a system that was revolutionary in those days: electrical transport. On 22 August 1897, the first electrical trams began to circulate between Rentería and Ategorrieta and the electrification of the city was completed on 22 October of that same year. 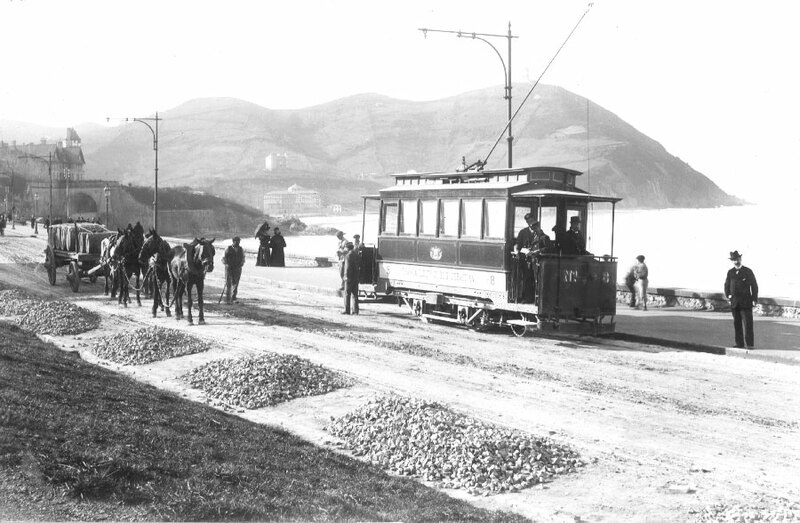 Donostia became the second city in Spain to have electrical trams (after Bilbao whose first line was up and running in 1896) and the first to electrify all its services (the Basque capital still had horse trams on some lines until 1909). Amara line (Urban), from El Boulevard to Amara station on 3 November 1903. Igueldo line, from El Boulevard to the lower funicular station on 5 September 1912. Gros line, from El Boulevard to Segundo Ispizua on 15 July 1915. Likewise, the original Venta Berri-Rentería line was divided into two, making El Boulevard into the end of both lines and the nerve centre of the city’s urban transport. On 18 July 1948, a new transport system was incorporated in the streets of the city, replacing the old trams on the Venta Berri and Igueldo lines for electrical trolleybuses. Just as had happened in many cities, not only in Spain but also in France, Great Britain and the US, the trams in Donostia had barely been modernised since they were electrified at the end of the 19th century and therefore after the tough post-war era their services were insufficient. Instead of modernising the system, as Central Europe was doing, the best option was to substitute the old models for trolleybuses. This mode of transport, in those days, was preferred over diesel buses as it had better power, acceleration, accessibility and ease of changing gears. Another important factor was that trolleybuses did not emit pollutants, although this advantage was not highly valued back then. After the trolleybuses replaced the trams on the Venta Berri and Igueldo lines, the replacement process continued on the Amara line (26 June 1949), the Gros line (25 September 1950) and the Rentería line (12 June 1953). Up until 11 July 1958, there was a small tram service between the Ategorrieta depot and the Herrera district on a route that mostly crossed flat land (including a small tunnel) like a train. On 18 July 1948, the Northern station line was replaced by the first diesel buses, this was later extended to the Egia district. In the 1950s, the Donostia transport network underwent small improvements, mainly focused on successive expansions of the Amara line, propelled by the urban extension process of this district. On 15 June, the service was extended to Plaza del Centenario. Later, on 26 May 1960, it was extended to Plaza de Pio XII and on 25 July 1961 the route reached Anoeta. In the 1960s, buses started to take over from the trolleybuses, at a time when the value of a more environmentally friendly and non-polluting transport system was still not properly appreciated. For many years, in fact, the CTSS network was powered by the Berchín hydroelectric station on the River Leizarán. It was in this era that double-decker trolleybuses were introduced. These were purchased from the London Transport Executive and are seen by many to be the company’s most emblematic vehicle. One of the first bus network extensions was the inauguration on 21 March 1960 of the Amara to Ciudad Sanitaria line, followed by the Altza line, on 19 September 1966, which over time became one of the most important lines in the city. On 31 December 1968, the process of replacing the trolleybuses with diesel buses on the Venta Berri and Igueldo lines was initiated. In 1971, trolleybuses disappeared from the Gros and Amara lines (on 7 March and 14 June respectively). 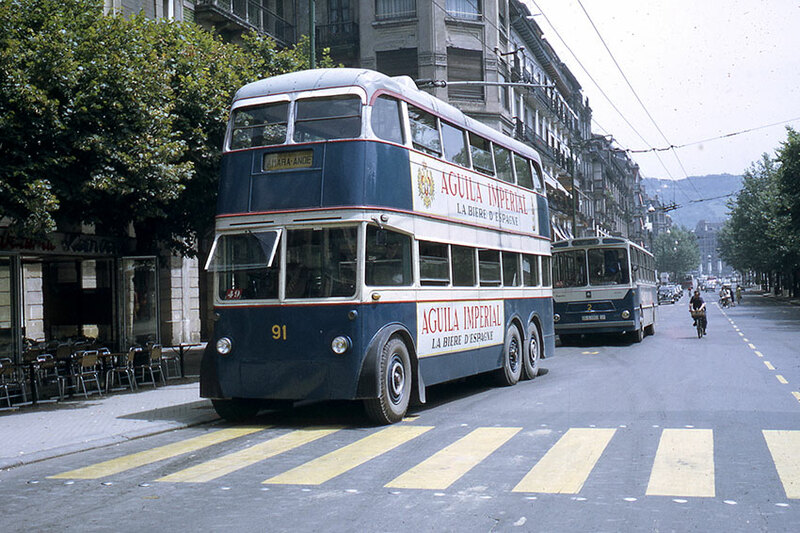 The last trolleybus service was on the Rentería line on 19 December 1973. From this date onwards, all public transport services in the city were served by bus. In spite of the financial difficulties that the CTSS experienced at this time, the company, working together with the City Council, did not stop improving and extending its services. One of the major milestones was on 30 September 1974, when the Gros-Amara line was inaugurated. This was first line to cross the city and would serve as a model to introduce other routes such as the Altza-Antiguo route. The 30 September 1981 was an important date in the history of the CTSS, when Donostia City Council acquired the majority of the company’s share capital. In this new era, the network has continued its expansion and improvement process by creating new lines to under-serviced districts such as Rekalde or Martutene. At the same time, the company sold the Rentería and Beraun lines as they both lay outside the city boundaries. The 1 September 2003 was another important milestone in the history of the CTSS, when the company moved to the new Marrutxipi Depot, a new modern facility that has helped to drive forward the company’s change process based on introducing new technologies, renovating the management team and changing of corporate image. 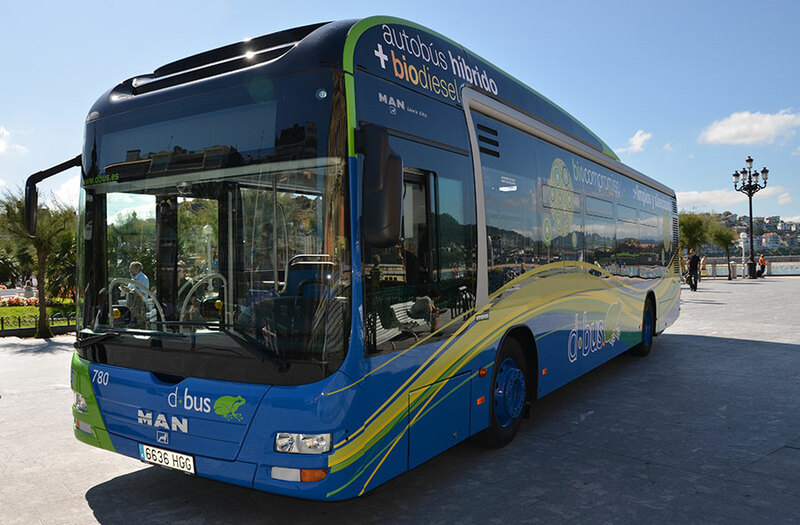 In 2005, Compañía del Tranvía de San Sebastián changed its name to DONOSTIABUS, also known as DBUS, and presented its new logo of an Igara Mediterranean frog (a native species in danger of extinction), and added green to San Sebastian’s traditional blue as a symbol of its commitment to the environment. That same year, Compañía del Tranvía de San Sebastián decided to invest in microbuses to cover the city’s higher areas which up till then had had no service. The first line of microbuses started working on l 4 April 2005, connecting the districts of Aldakonea and San Roque via the city centre. In the light of the popularity of this line, a second route connecting the districts of Zorroaga and Rodil started operating on 24 April 2006, and was quickly followed by other new routes covering other districts. The company has grown considerably since 2005 and has improved its offer with more services, timetables and routes, with the result that buses now reach over 99% of the homes of those living in San Sebastian. Great efforts have likewise been made in technology, and Compañía del Tranvía de San Sebastián is one of the most technologically advanced transport companies in the world, as endorsed by the important international awards and acknowledgements it received from 2010 to 2013. These technological advances are related to information systems and management systems as well as to the actual bus fleet, which is increasingly environment-friendly as underlined by the purchase of the first hybrid bus in 2011 and the first 100% electric bus in 2014. The efforts made to improve services and to implement new technology are backed up by the people who use the bus on a massive scale, making San Sebastian, of cities of its size, the one where the bus is most often used. This is proven by the fact that each person in San Sebastian uses the bus 160 times on average a year, one of the highest figures in Europe. 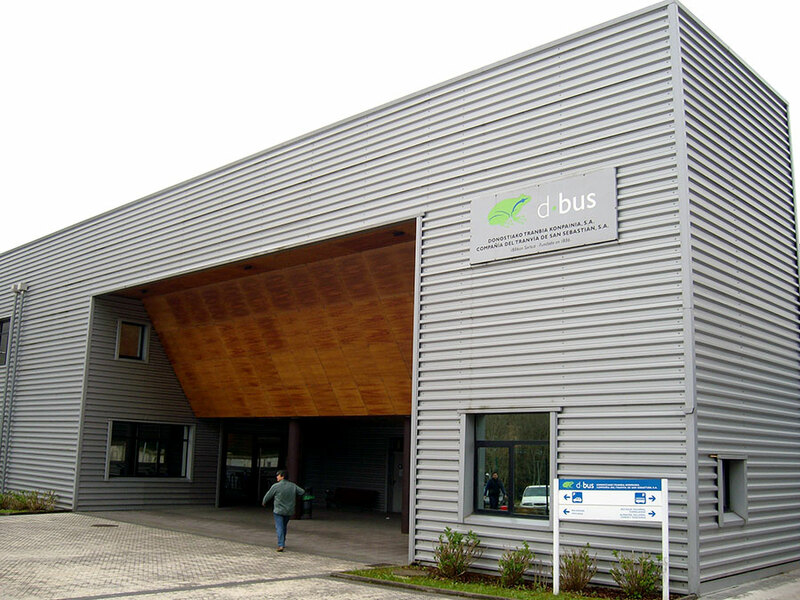 In 2012 Dbus had been serving the people of San Sebastian for 125 years. Celebrations included a variety of activities with thousands of people taking part. Today, with a history of 130 years, Dbus continues its daily work to help improve the quality of life of all of San Sebastian’s citizens, whether they use the bus or not, making it a more environment-friendly, liveable and, in short, a more human city.